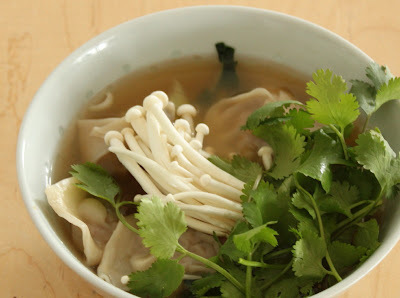 The Food: Wonton Soup with Enokitake Mushrooms. What a great soup this was. This was strictly do-once improvisation driven by available ingredients. I had a Vietnamese Pho stock, I had my own wontons and there was coriander and Enokitake mushrooms that I bought last Sunday on a trip to London (London, Ontario, that is). Since everything was on my mise-en-place table it took just 15 minutes from start to plating. Nothing wrong with this type of “cooking from scratch”, if you ask me. After all, I did make the stock, I did make the dough for wontons and I did make the filling. Not at the same time, but I did make it from scratch.